Fest Verao Paraiba was the stage to welcome the biggest Brazilian bands in January. Giselle Claudino never wastes time wherever she is. 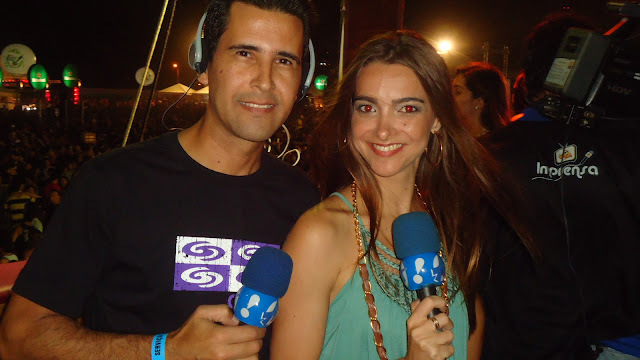 While vacationing in Joao Pessoa- PB- Brazil,instead of only enjoying the good music & concert of Ivete Sangalo, Biquini Cavadao & Skank, she doubled the excitement by reporting live from & during the concert along with TV presenters Cezar Campelo & Marilia Lima.
" I couldn't have had any more fun, reporting live is the best thing I can ever do & dancing at Ivete's live concert just brings up my energy to the point I forget everything else & let myself GO".Adds Giselle. Coming up soon: Coluna Social by Giselle Claudino exclusive for http://www.setemagazine.com ,click & check out the Magazine for details. You will be able to check all the parties and events I'm attending and who knows, you might be even there with me & soon in my collumn too.Photos, photos, tons of photos. Soon.Cheers!